This is the first instalment of a special summer series focusing on a research project in Nuu-chah-nulth Ha-ha-houlthee. This and other research-based projects help further the objectives of Uu-a-thluk and Nuu-chah-nulth First Nations to manage our aquatic resources consistent with Nuu-chah-nulth practices and principles, complimenting and reinforcing Ha’wilth patuk Ha’wiih (Nuu-chah-nulth governance). The Somass watershed is made up of three main sub-basins, Great Central Lake, Sproat Lake and the Ash River watersheds. In the 1950s, DFO improved fish access and use of fish habitats to the Sproat and Great Central Lake watersheds by constructing fishways. In contrast, three barriers define the use of fish habitat in the Ash River as they present varying degrees of difficulty to fish passage. 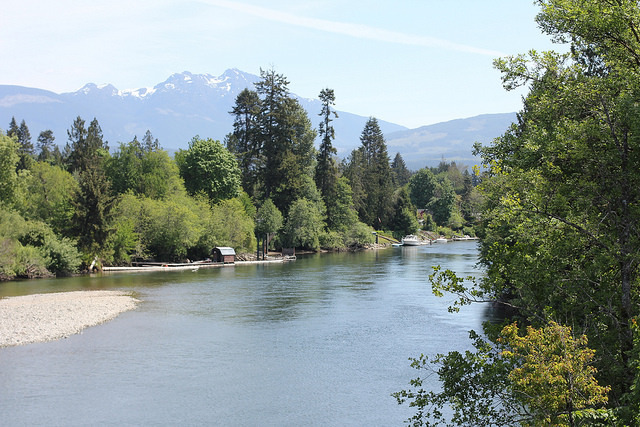 This includes the Elsie Dam built around the same time as the Sproat and Great Central lake fishways, which has no provision for fish access to the Elsie Lake reservoir. Contemporary steelhead populations in the Somass watershed include apparently distinct summer and winter runs. It is generally assumed that the natural barriers in the Ash system (Dickson Falls, Laterman Falls, Ash Falls) are providing selective access to habitats above Dickson Lake and offering a refuge for summer steelhead. 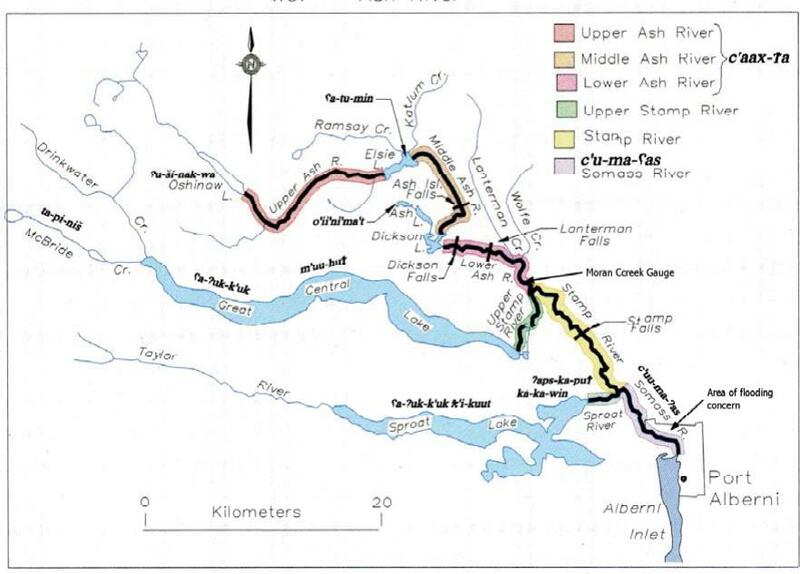 On the other hand, Hupacasath Traditional Ecological Knowledge (TEK) asserts anadromous salmon had access to Elsie Lake and above before the development of the Elsie Lake hydro power development. This claim is generally not supported by Department of Fisheries and Oceans (DFO) or the Provincial Ministry of Environment (MOE) as there is no documented evidence of anadromous salmon above Dickson Lake prior to the development of the Elsie Lake Dam. However, recent studies have provided evidence of historical anadromous fish present above Elsie Lake based on Nitrogen 15 (Nitrogen from marine sources such as anadromous fish) in lake sediments. Nitrogen 15 signatures in the lake sediments of the upper Ash River system indicate anadromous fish were present in Elsie, Oshinow and McLaughlin Lakes prior to the dam development and disappeared just after the dam was completed. As well, juvenile coho have been observed above Dickson Lake on occasion and adult steelhead are regularly observed at the base of the Elsie Lake Dam in the late spring and early summer. “There is great interest to Hupacasath First Nation and others in improving access of anadromous salmon such as coho and sockeye to the mid and upper Ash River system,” said Jim Lane, Uu-a-thluk Southern Region Biologist. The proponent of the study under discussion was Hupacasath First Nation, with most of the funding coming from BC Hydro’s Fish & Wildlife Compensation Program (FWCP). The leads were Uu-a-thluk Biologist, Jim Lane and Scientist Dr. John Taylor with assistance and input from MOE and BC Conservation Foundation staff. Note: The next installment will look at fish migrations and ways to determine if a steelhead is either a summer or winter run. To consult the PDF version, go HERE.